We’re happy to announce the launch of PedigreeMap™, an innovative way to visualize your family history. PedigreeMap plots events from your family tree such as births, marriages, and deaths, as well as digital and scanned photos on an interactive world map. Have you ever wondered how close your ancestors lived to one another? Where exactly your great-grandmother was born? 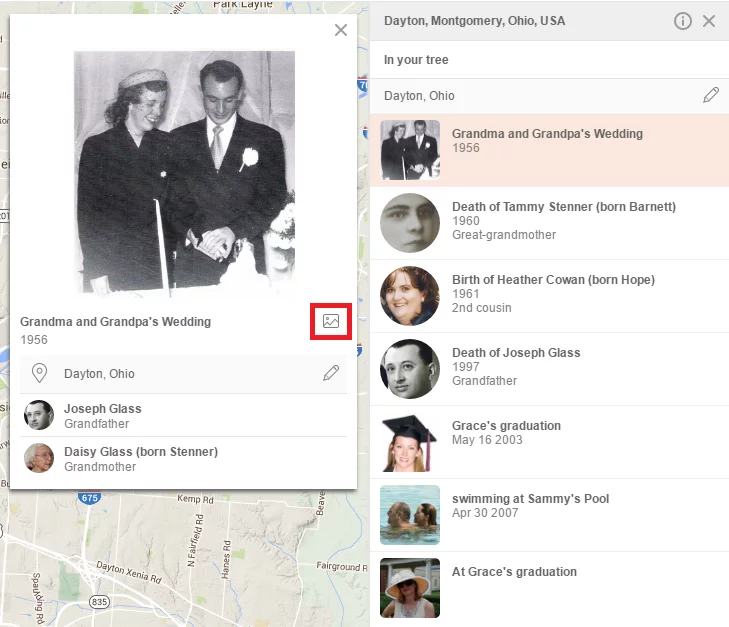 Seeing significant events from your family’s past on a map allows you to gain a clearer picture of your family’s journey. Trace the locations of your ancestors and get new geographical and historical insights into your family history. You may suddenly realize that all of your grandparents come from a tiny region in Europe; or that your second cousins are actually your neighbors. PedigreeMap displays all your photos and events grouped by country and location, allowing you to easily filter the map to view it by person, family group, event type, and time period. If you have a tablet device, such as an iPad or an Android tablet, PedigreeMap will look awesome on it. You will be able to pan and zoom with your fingers, and enjoy the maps tremendously. PedigreeMap is free for all users. 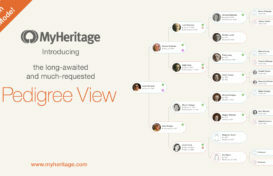 To access it, log on to your MyHeritage family site and select PedigreeMap in the Family Tree menu. If you’re a new user, sign up first from the MyHeritage homepage, upload your family tree as a GEDCOM file, and you can immediately view a PedigreeMap for your family tree. 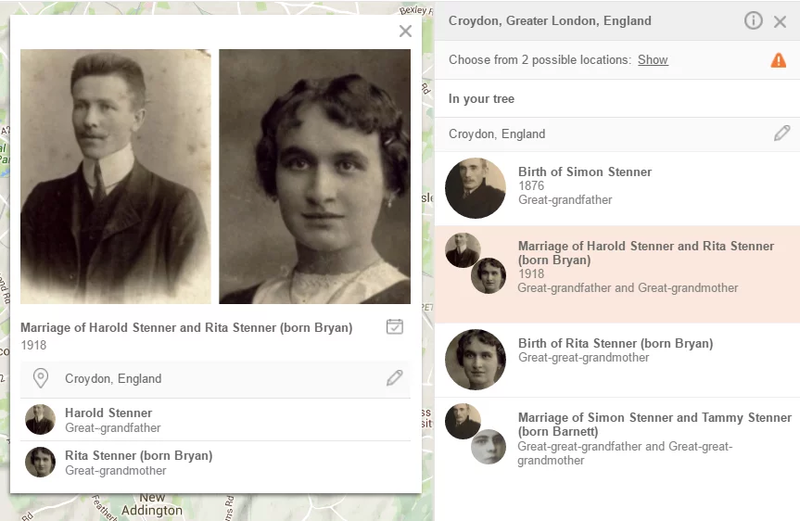 PedigreeMap displays family history events from your family tree on the map. MyHeritage runs a process in the background that converts every place name referenced in your family tree or your photos, into geographical coordinates. This process is called geocoding. After the coordinates are calculated, your family history events are plotted on the map. The main screen of PedigreeMap shows the embedded map. On the left-hand side, there is a list of all places that appear in your family tree. The numbers on the list correspond to the number of references to each place in your family tree. The map shows pins for each location. Use the mouse to pan the map, dragging it in all directions. You can zoom in or zoom out using the small plus and minus controls in the bottom left-hand corner. Click on any place name in the list on the left in order to bring that place into view on the map. Whenever you click a location from the left-hand panel or on a pin in the map, MyHeritage will display all the events and photos that happened in that place in the right-hand panel. Click on any of the items in the right-hand panel to zoom in and to see them in greater detail. This will reveal all the people involved in the event. Click the calendar icon to edit an event, or the pencil icon to edit the place name. 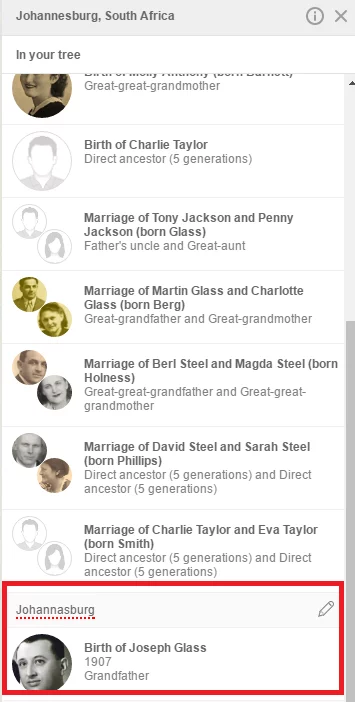 Use the drop down menu for each individual listed to view their profile, view them in the family tree, view their relationship, or to show all references to them on the map. For photos referenced in the map, such as the photo below, you can also click the photo icon to view the photo in full size. If you have more than one family tree on your family site, you can switch quickly between your family trees using the drop down menu. PedigreeMap can display events and photos for all people in the family tree, or a subset pertaining to a particular individual or subset of individuals. Start typing in a person’s name, and you will receive suggestions immediately. You can then select a specific individual from the drop-down list. 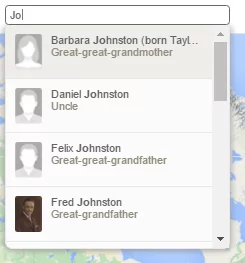 After selecting an individual from the family tree, use the proximity drop-down box on the right to show places for his or her extended family, immediate family, ancestors, descendants, or only for that person. By default, places are sorted by the number of references in descending order and are grouped by countries and states. Use the up/down arrow to sort by name instead and to clear the grouping. Choose to filter by place by entering a name in the search box above the list of places. Start typing in a place, and you will receive suggestions immediately. Click the funnel icon on the top right for more filtering options. Choose to see births, deaths, photos, other, or any combination (by default, all of them will be checked). Move the year slider to show places that are referenced within a certain range of years (by default, this will include all events from all dates in your tree). 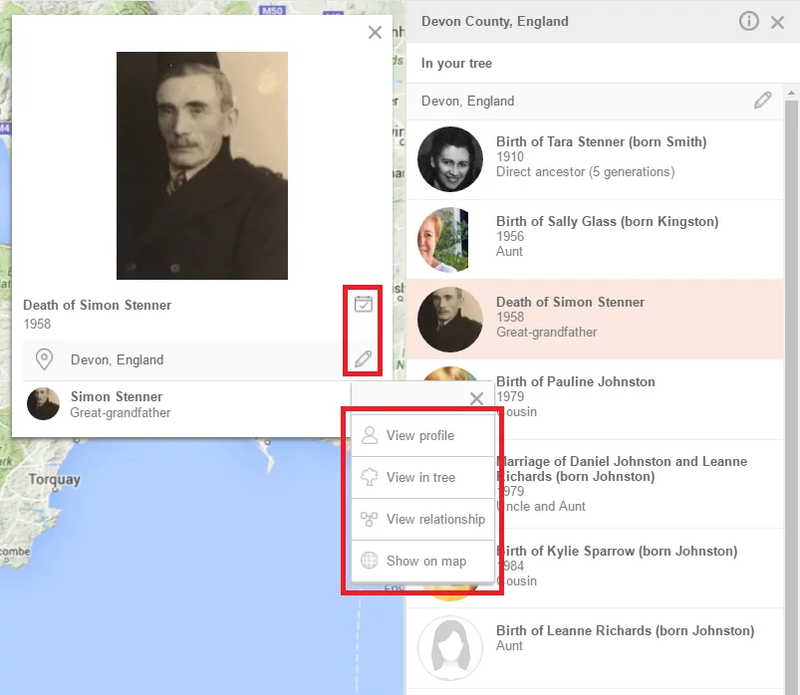 Move the generations slider to show places that are referenced within a range of certain generations in your family tree. Click the full-screen icon to view PedigreeMap in full screen. One of the most useful features in PedigreeMap is the ability to “Find and Replace” place names for standardization and to improve the data quality in your family tree. If you have spelled a place name incorrectly or inconsistently throughout your tree, you can easily change these in PedigreeMap and this change will be reflected on that individual’s family tree profile. Place names are grouped by location so you can easily see if you have misspelled a place name. 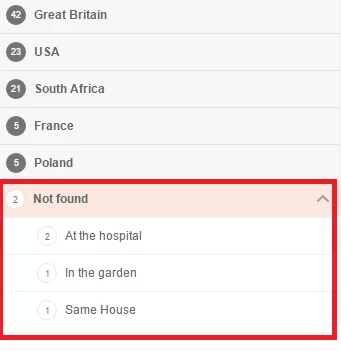 PedigreeMap indicates places where you didn’t use standard canonicalized place names — for example, places that mention a city without the country name. It will detect spelling errors in place names, and suggest fixes. A small red dotted line next to a place name in the list indicates that there are further suggestions for change. Clicking on a place name with a suggestion will show all events that happened there, and the errors or missing information can be edited on the spot. Place names in the left-hand column that are ambiguous are listed with a gray exclamation mark next to them. In the example below, the city Salem was entered into the family tree. Salem can refer to a city in the U.S. state of Massachusetts, the capital of the U.S. state of Oregon, among other options. If you click the exclamation mark, you will be presented with the most likely options, and you can select which one you meant. You can then choose to change all the references in the tree to that location. Places that could not be located on the map are grouped at the bottom of the list on the left-hand side, and can be edited directly from PedigreeMap. All of these tools help you avoid ambiguity and enhance the quality of your data entry. Selecting the Heatmap visualization gives you a high-level view of your family history, showcasing which geographic areas have a higher concentration of references from your family tree. Access the Heatmap by clicking the Heatmap button on the bottom right-hand side of the map. It is especially useful when combined with filtering by year and type. 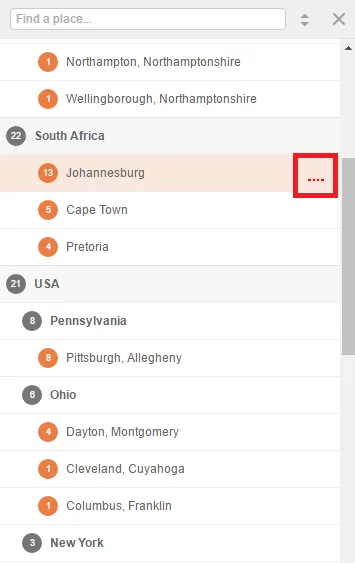 For example, selecting different year ranges and viewing the Heatmap for each selection will highlight the migration of your family over the years. We invite you to try out PedigreeMap and get a new view of your family history. In the future, we plan to make PedigreeMap even more useful by allowing you to not only view places from your own tree on the map, but letting you see all the public data from all the user trees on MyHeritage on the same map. Imagine that your grandfather came from some small ancestral town in Poland. Our vision is to allow you to visit that town on the map, and see ALL the public photos taken in that town by ALL the users on MyHeritage. If your grandmother immigrated through Elis Island, and the ship that she sailed on departed from Hamburg, we will show you all the passengers and all the records from the ship. Your grandmother will appear on the map in Hamburg where she departed, in Ellis Island where she landed, and in Chicago where she later resided, along with all the people in other MyHeritage trees who made similar journeys. We would like to evolve PedigreeMap into a tool for showing millions and even billions of data points, pictures, and events that have been shared publicly by other users. 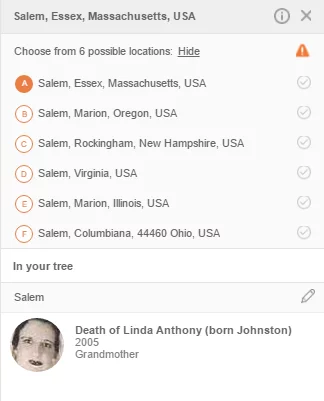 There will be an option to specifically filter the map and show places of interest in your family tree with data by all other users and all historical records. Then PedigreeMap will also become an exploration tool for historical records. Very good, and it will be useful. The Pedigree Map will be most useful. Please note that the Australian state you have labelled “Southern Australia” is “South Australia”. 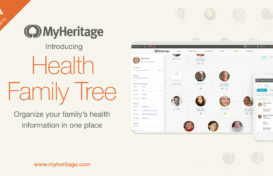 What’s the cost to a myheritage member. Can the map be used on my iPad. If it can, can I send or have sent a copy of the iPad-capable package to other members of my family so they can see all of this wonderful information on OUR family? 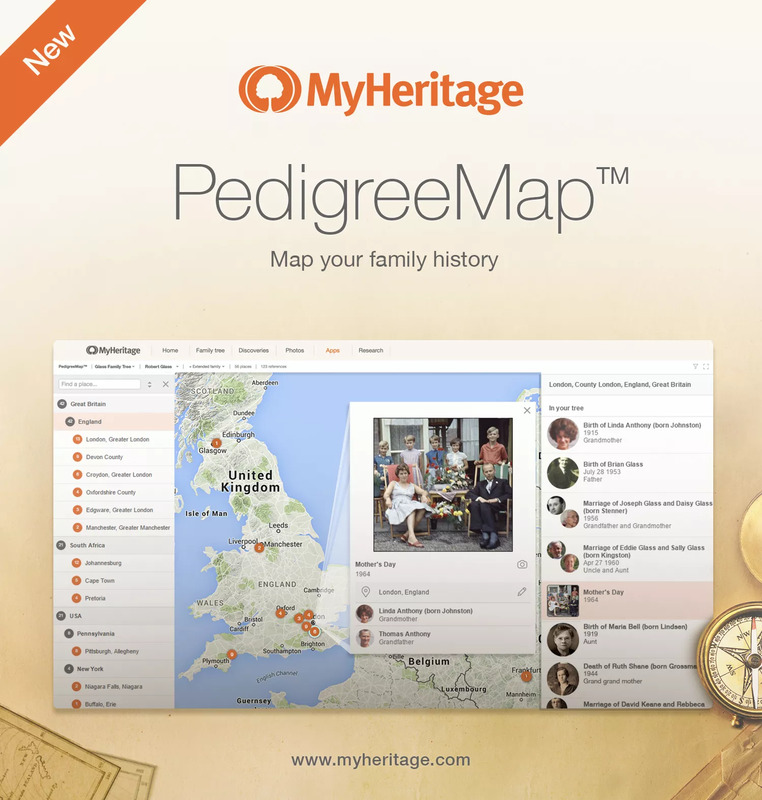 The PedigreeMap is completely free for MyHeritage users. All of your family site members will be able to access the map just like you. PedigreeMap looks amazing on an iPad, and it’s easy to use as well. Interesting concept – I’ll have to check it out. Now MH users need a pedigree format for display of their family tree! Would like to be able to view where I am, then the generations preceding from each line. I’m sure members would like an easier way to navigate their trees. Thank you. Very nice addition! Thank you MyHeritage for continually working to improve the researcher/data/sharing experience. This is wonderful. When I first saw it and began using it I became overwhelmed with the density of the data. One question, will there be a way to bring the mapped data into a printed document? I can crudely do this now but not all of the info comes to the printed document in a logical or pleasant looking formatted document. There isn’t currently a way to print out data from the PedigreeMap. Thanks for the suggestion! I have dreamed for years of something like the heat map to follow migration of my family. If that were all you added, I would be very happy. It looks like you have gone above and beyond my wild wishes, and I feel like a kid in a candystore. I use the “snipping tool” to turn pages from programs like Pedigree Map into jpegs. You could tie them to reports from MyHeritage. This feature look like it will be fun. I’ll have to play with it much more. The feature looks good. Will try it. Oh my gosh. The map is absolutely wonderful. Something that has added so much to our family history. Thankyou. Can’t wait to jump right in and use this, thanks. Sounds interesting. Hope it turns out well. Will have to try it. Well done. looks very comprehensive, you dont mention cost however. PedigreeMap is free. Enjoy using it! Pedigreemap is brilliant! Thanks so much. Looks very interesting, like to try it . Very interesting and I sure would like to try it out. Wow,that’s incredible!What a privilege to live in this technological age. Very interesting how you have been able to obtain and combined information everywhere. I have tried it and the map is such a joy to see and use. Navigating will take some time with all you can do with it. This is how I want to look at my ancestors, where they lived, where their ancestors were, and all my direct ancestors at a specific time in history. Do I understand this, correctly? I can select 1066AD or 12th century? Provided that you have places listed in your tree for events that happened during that time, you should be able to filter a certain time period and then see all the events in your family tree for that time period. Sure would be nice to be able to print it out…. I would really like to try it and am veryerested. What a wonderful help. Thank you so much! Thank you Esther. I would very much like to use it as my ancestors appear to have moved all over the world from Ireland & I am having trouble trying to work out who is who. All looks great & wish I’d seen it 6mths ago to really start studying better – still will look into it further. I would be interested in receiving this. I love genealogy. I like the ideaand think it is useful. 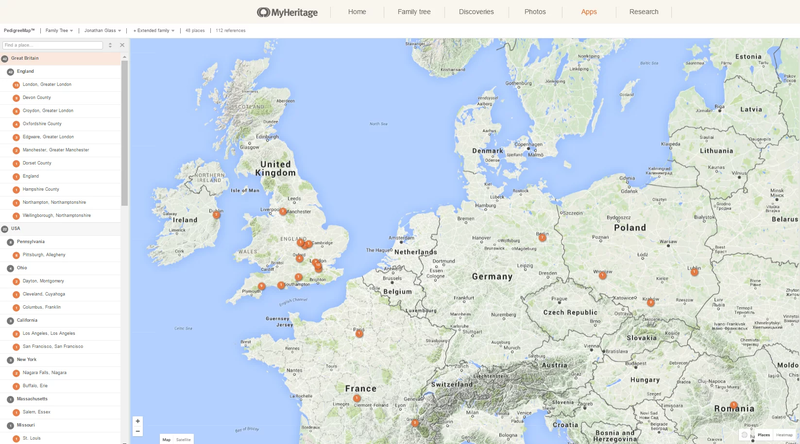 The PedigreeMap is a free feature for anyone with a family tree on MyHeritage. We hope that you enjoy using it! Fantasztikus lehetőség ! KÖSZÖNÖM !!!! thanks, looks like fun to see where people are living and moving about the world. I have been unable to install this new feature, how do you do it?? You’ll be able to access your PedigreeMap on your family site, under the tab Family Tree.